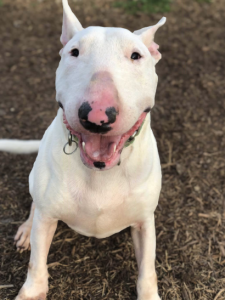 MacElroy is a smaller sized bullie boy, around 1-2 years of age. He is leash and crate trained and gets along with other dogs and also with children. He is around 40 pounds, neutered and ready for a new home! An adoption application is required prior to meeting the available rescues. We will schedule a home visit prior to meeting the available bull terriers and may make periodic visits after adoptions are finalized. We will do a foster to adoption program 10 days to 3 weeks to ensure the rescue is a good fit with the new family. At the end of a successful foster to adopt period, we will finalize the adoption contract. Our fees range for $200-600 based on each rescues age and health.